Tigers shortstop Jose Iglesias is in his fourth MLB season (missed all of 2014 with shin injury). 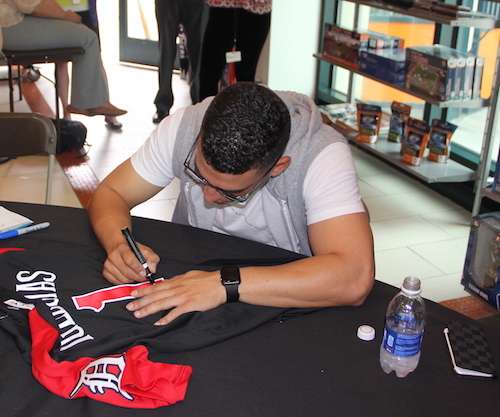 Iglesias started his career in the Red Sox organization, before getting traded to the Tigers in 2013, as part of the Jake Peavy deal. This season, Iglesias is batting .302, with 22 RBI and 11 SB. Iglesias was named an All-Star reserve, earlier this season. Recently, iFolloSports.com Michigan correspondent Lance Martinez captured the above original photo of Iglesias signing autographs at The D Shop, inside the Tigers home stadium of Comerica Park.